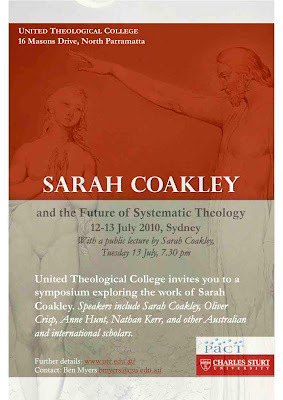 So I've finally done up a poster for the Sarah Coakley symposium. If you visit the website, you can check out the programme and the abstracts, and you can also download a registration form if you're interested in coming along. Later this year in Sydney, Jeremy Begbie will present the New College Lectures – I'm really looking forward to it! And it's not exactly an academic conference... but in May, a crazy cool radio station in Sydney will be doing a 5-hour Bob Dylan marathon, in honour of the great man's birthday.